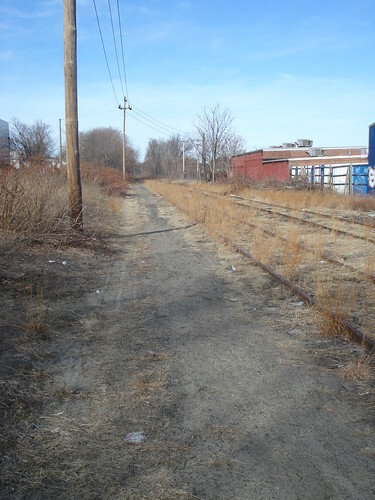 Check out the Old Rails to Green Trails: EPA Helps Lawrence MA Plan a Promising Future video! The Lawrence Rail Trail is a 1.4 mile path that will run from the south bank of the Merrimack River to Manchester Street Park, then on into Methuen. The trail will cross the Merrimack River and swing northwest across Broadway Street (Rt. 28). The trail will then run roughly parallel to Broadway Street at a northerly direction towards the Massachusetts/ New Hampshire boundary. The Lawrence Branch of the Rail Trail is one part of The Manchester and Lawrence (M&L) Branch, a railroad right-of-way between Lawrence, MA and Manchester, NH which will be converted into a multi-use recreational path. When constructed, the trail will provide unimpeded pedestrian access to many facilities along the Merrimack River, plus Downtown Lawrence, The Lawrence Family Development Charter School, Bourgoin Park, Manchester Street Park, and the Spicket River Greenway. It would offer many recreational opportunities for Lawrence residents such as walking, jogging, running, biking, rollerblading and skateboarding plus cross country skiing and snowshoeing during the winter. The city of Lawrence is currently designing the trail, while the city of Methuen is currently paving their portion. The Lawrence section is in the pipeline for Federal construction dollars. Please watch this page for future updates!